The Prussians, commanded by Blucher, comprised two corps (3000 points using the Road to Glory system). The stronger, II Corps under von Kliest, comprised four infantry divisions and a cavalry reserve. Bulow’s III Corps was spread out and as it transpired only two infantry divisions and a cavalry division would be available for the upcoming battle, the remaining divisions would not reach the area of the battlefield until nightfall. The infantry divisions generally comprised three brigades, one of regular infantry, one of reserves and a final brigade of landwehr supported by artillery. The cavalry also comprised three brigade, one of dragoons, one of light cavalry and a final one of landwehr. Opposing them Ney also fielded two corps (also 3000 points). X Corps, commanded by Rapp, comprised four infantry divisions and a cavalry division. This corps drew heavily on various allies and included troops Baden, Hessians, Poles along with two divisions of French Provisionals, hastily raised. Oudinot’s XII Corps small corps comprised Raglovich’s Bavarians and supported by Pacthod’s 13th Division. Ney however was further supported by a division of Young Guard and a “Heavy”, in name only, cavalry division of two dragoon brigades. As Blucher viewed the battlefield about, around noon he found himself outnumbered with only Kleist’s Corps deployed on what would become his centre and right (Build up Echlon Right card 10). Deployed opposite were six French infantry divisions and one cavalry division (Returning Detachment – Reserve card 14). Clearly the burden of the attack rested with the French. However, with a portion of the French army behind a stream and separated from the remainder BLucher opted to advance his centre and right while expanding his own left as elements of Bulow’s III Corps arrived. Indeed, by 12.30am two of Bulow’s divisions were beginning to deploy and by 1.30pm Hessen-Homberg’s division were moving rapidly forward. The Prussian 11th and 12th Divisions, actually designated brigades in Prussian terms, were first to be engaged when their artillery began to fire on Granjean’s (Polish) and Heudelet’s divisions deployed behind the Verbeck stream. The Poles quickly fell back, replaced by Baden and Hessians of 39th Division. However, as both commanders were reluctant to press home with the bayonet a long range artillery dual resulted. By 3pm having had suffered the worst of the exchange the Prussian divisions retired 400 yards. Above, the situation around 1.30pm with the French 39th Division, comprised of Baden and Hessian troops, in the foreground with Prussian troops opposite and lining the stream. French troops extend the line. On the Prussian left varoids regiments deployed from road column and now extend the Prussian left. As a result the weight of the Prussian attack moved to the left centre where attacks were launched against Semele’s 52nd Division holding a small partly wooded hill around 2pm. The Prussian Regular and Reserve regiments were thrown into the attack. Supported by artillery the attacks were driven home with great élan, often supported by Prussian sharpshooters. In due course the Semele, the French divisional commander, abandoned the hill. However, when pressed by the advancing Prussians, he reformed and tried to regain lost ground. In the following hours, despite desperate efforts by its officers, the 52nd Division collapsed as a fighting unit. A hole now appeared in the French centre, until around 6pm, Brigade Rothemberg, from the 2nd Young Guard Division, stabilised the critical situation with a counterattack. Above and centre left, the Prussian 9th Division prepares to advance on the 52nd Division holding the small hill. The 9th Prussian Division comprises three brigades and is supported by the 10th Division. Each division has its landwehr brigade deployed to the rear of the main line. Prussian artillery is also deployed to the rear and will soon move forward. Top left Prussian troops from Bulow’s Corps can be seen extending the Prussian left. On the extreme Prussian left a confused battle developed. Initially Bulow’s divisions seemed to have the advantage. Especially as Oudinot had dispatched the 29th Bavarians in a flanking movement. With poor marching drill the Bavarians were significantly delayed, allowing the Prussians to inflict considerable damage on the French 13th Division that alone under Pacthod held the French right. However, once the Pacthod was reinforced by the Young Guard the situation stabilised. Now, the flanking Bavarians and 4th Cavalry Division attacked Bulow’s own left. Bulow’s divisions was forced, reluctantly, to give ground. As Bulow came under pressure on the Prussian left so did the Prussian right. Around 7pm the reformed Polish division, supported by the 8th Light Cavalry Division bEgan it’s own attacks on the Prussian right. 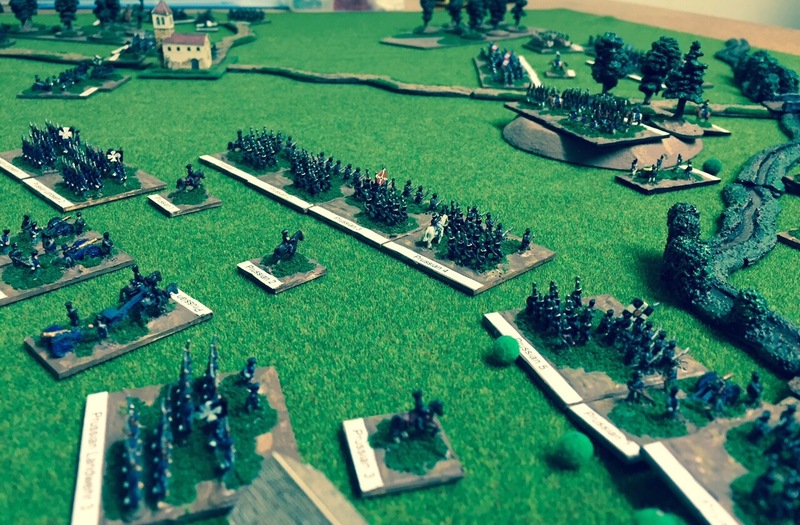 A poorly positioned Prussian horse battery was quickly overrun and a general melee developed. With the Prussian cavalry forced back, though not broken, Blucher determined it was time to retire and reform while the army could be covered by his own cavalry. 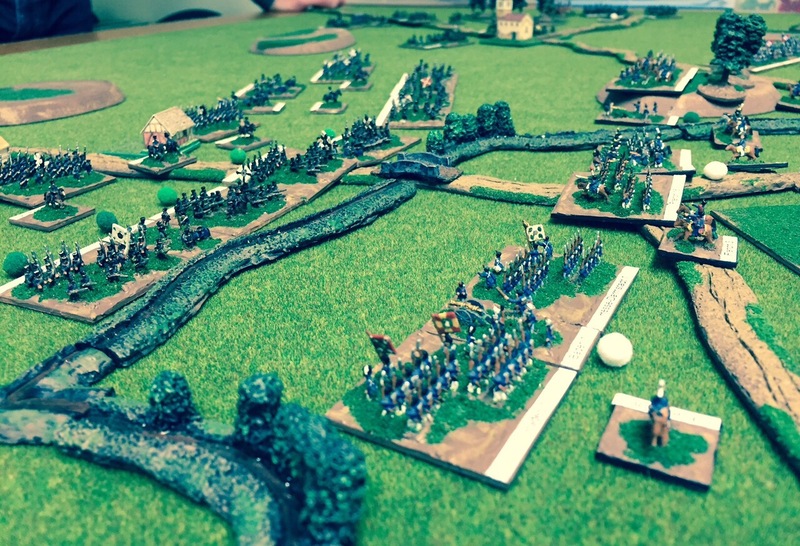 The Battle of Zwenkau provided an excellent evenings gaming for all players. Poorly drilled troops provided plenty of challenges for manoeuvre while delayed arrival and initially unbalanced forces provided scope for an interesting battle to develop.